Editor's Note: Road Trail Run is thrilled to welcome Coby as a Road Trail Run tester reviewer. While a rising college distance star Coby underwent a kidney transplant and has come back stronger than ever with a 2:40 marathon, an epic 9 hour winter FKT run and snow shoe traverse of the White Mountains Presidential Range and many mountaineering exploits. He coached Manchester Central High School to a New England Championship and one of his former students recently ran the recent Olympic Trials in the steeplechase. New Balance Vazee 2090 is a 9.1 oz/258 g (Men's 9), 8.5 oz./230 g (Women's 8) performance light trainer with a 26mm heel, 20mm forefoot, 6mm drop. Available now. $150. Inspired by Trayvon Bromell, a young sprinter who won Bronze at the World Championships in the 100 meters and just qualified for the Olympics, distance runners should not be afraid of this premium variant of the popular Vazee Pace. There are 2 distinctive elements to the 2090 which are also are the features which distinguish it from the Vazee Pace. 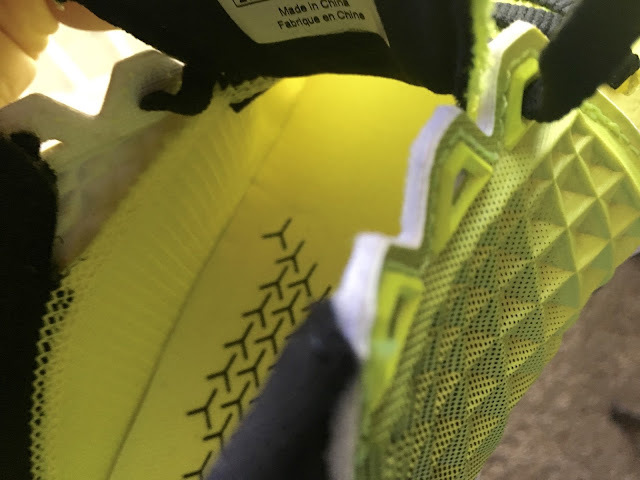 Less obvious, but more critical in terms of ride, is a 3/4 length layer of N2, a nitrogen infused TPU between the outsole and midsole. 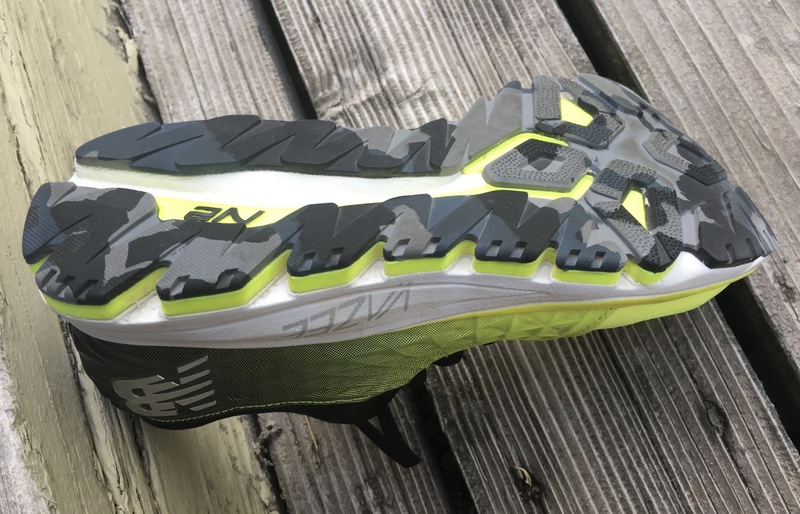 New Balance has previously used N2 as a rock guard layer in trail shoes but this formulation is considerably softer. The layer runs along the lateral side from the heel and then expands to full width up to to the toe flex point. Essentially this layer, not as firm as the midsole, and springy when pressed. seems to reduce shock and vibration from the firm and responsive but somewhat harsh trademark New Balance REVlite midsole (white layer). At the same time it provides a touch of dynamic rebound as other TPU based approaches such as adidas Boost do. Further the podular nature of the N2 layer in combination with the outsole tends to smooth transitions when compared to straight REVlite midsole shoes such as the 1400. Bottom line the 2090 adds about 4mm of shock attenuation and springy rebound from the N2, and 0.5 oz weight, to the just released Vazee Pace v2 (24mm forefoot/18mm heel). While I have not run in the Vazee Pace, I have run in the REVLite equipped 1400 (25mm heel/15 mm forefoot) and found it very firm. The 2090 should sit in terms of cushioning feel between the Vazee Pace and the softer Fresh Foam Zante (23mm heel/17mm forefoot) which uses a different midsole material. I have run the Zante and much prefer the extra stack and spring of the 2090, despite the additional approximate 1 oz in weight of the 2090. The upper has a comfortable if snug fit, even if sized up half size by New Balance. Most will be happy to do the same as the saddle holds the foot extremely well and the extra toe room is welcome. 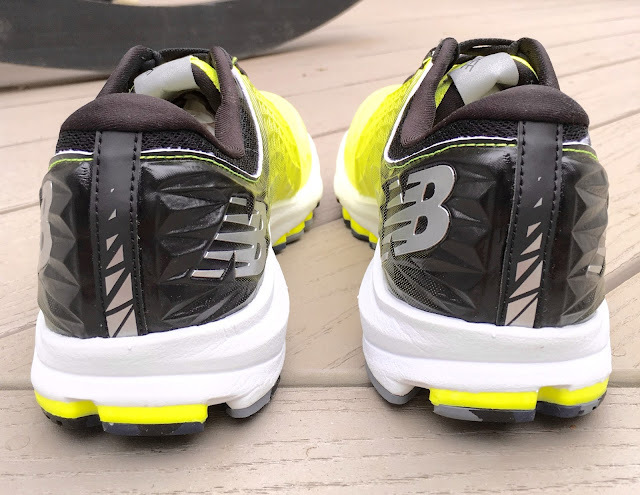 The front mesh is soft, somewhere between a knit and a mesh, and other than the toe bumper there are no overlays up front, again accommodating various foot types, part of New Balance's design goal for the shoe. The welded toe bumper is adequately high and of a soft and relatively thick rubber material. The fit is very comfortably snug with some stretch and with no pressure points. There is shortened, lightly padded conventional tongue, with a bootie of the same material as the front mesh reaching up to the lace holes in the saddle (white in picture) wrapping over the foot. Tongue, side bootie and front of the shoe all join together at the third lace hole where the saddle ends. The overall upper execution is excellent with no sense the saddle gets in the way of foot movement, and with no irritation or constriction.from it. The heel counter is firm where it meets the midsole and then progressively softer as it goes up. Padding around the achilles and collar is light but adequate. For the first time New Balance branding is on the heel instead of the saddle, we think a fast, sharp look but a bit overdone at the rear of the heel with soft faceted triangles. Design yes but function? We previously discussed the midsole New Balance performance oriented firm REVlite with a layer of N2 TPU between the main midsole and outsole. The outsole appears to be one piece but interestingly the firmness and thus likely wear varies with distinctly firm rubber in the heel on the lateral side running up to the N2 logo. New Balance has potentially co-molded different densities of rubber but isn't saying. The rest of the rubber is softer. We expect plenty of wear from the outsole. No one should assume the Vazee 2090 is a soft, cushioned every day trainer. 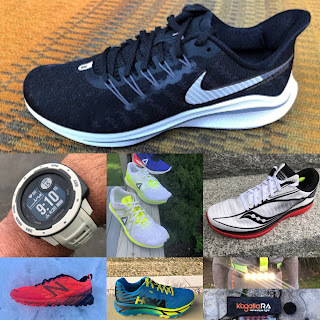 Faster runners and those seeking a performance shoe for tempo and faster marathons may find them a more forgiving shoe than a pure racer yet a shoe with lots of responsive road feel. I found the ride just forgiving enough for fast workouts and moderately long runs at all paces. Energetic, with a fairly stiff flex near the front of the shoe and great road feel this is not a bouncy, softly cushioned shoe but a well directed tuned ride, sort of like the Sport Mode in a luxury car. "The biggest down side of this shoe for me (so far running one 6 mile road run in them) is that they are HARD. I feel like they don't absorb much. I can see why this would be a good thing for a middle distance/sprinter using them as an everyday trainer (they do less mileage, run way faster and are generally working out more frequently than a distance guy). The sprinter/MD runner also doesn't want cushioning as it slows them down (the loose that energy). This shoe really beat me up...especially running on the road. " "Without a doubt this shoe is designed as a training shoe for a sprinter/400m runner. Distance athletes will benefit from this shoe as a tempo run training shoe (6x1mile at Tempo Pace or 2x5k at tempo pace). 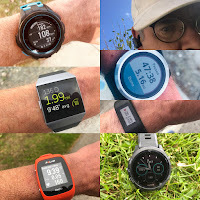 I could also see average to good marathoners (3 hour -2:50 marathon runners) using them as a racing shoe for races from 10 miles to the marathon. " At a premium $150 price point the decision to buy the 2090 rests on road ride preference. If you like a firm dynamic ride for up tempo running or every day running but would like a little less of the jarring shock typically found in light performance shoes with firm foam, the 2090 is a great choice. The dynamic saddle and N2 layer are worthy innovations which we hope New Balance continues to pursue. -0.1 for more weight than many of today's performance trainers. The 2090 were provided at no cost to Road Trail Run. The opinions herein are entirely the authors'. Over 30 in depth Road and Trail Shoes reviews so far in 2016! I guess my biggest issue with the review is that you didn't have a sprinter test it out. I would say at least 99% of running shoes are built for endurance athletes. The shoe SHOULDN'T need to have broadened utility, when it's designed for maximum speed and different mechanics. I'm assuming that's why the forward flex point is later in the gait of the shoe and so on. I haven't yet tried this shoe, but I've been looking forward to giving it a shot. As someone with a background in sprinting, I honestly feel a little insulted that you had a distance runner review this model. You wouldn't ask Trayvon Bromell to review the Hoka Clifton or something similar, would you? I expect better from you guys, because the rest of your content is great. Thanks for the review and the time taken to write it. Constructive criticism for Coby and perhaps the editor - take it or leave it - future reviews would benefit from a decent proof read, I found this very hard to read in places! 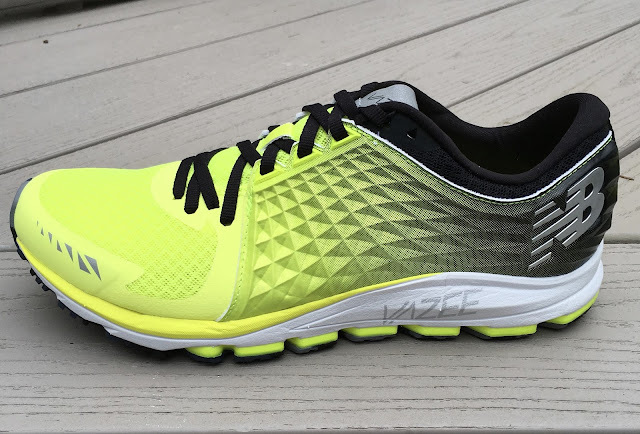 "No one should not assume the Vazee 2090 is a soft, cushioned every day trainer." Does the "not" belong in that sentence? You've got a double negative in there.